Minot State University’s Dome will come alive with tradition, color and movement. 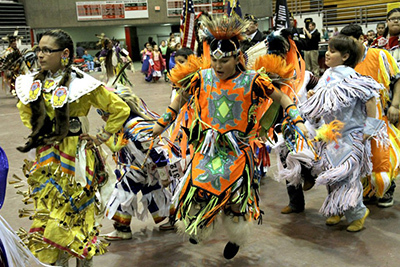 Native American dancers and drum groups from throughout North Dakota and neighboring states and provinces will compete during the 27th annual Native American Spring Honor Dance and Powwow Celebration May 6-7. This event, sponsored by the Native American Cultural Awareness Club, the Native American Center and the university, honors all 2016 graduates. Two "Grand Entries," the time when all dancers enter the arena, are scheduled for 1 and 7 p.m. daily. Following the 7 p.m. Grand Entry on May 6, the Stevenson family will host a Crow “push dance” special honoring Clifford Klimpel, graduating nursing student. After the 7 p.m. Grand Entry on May 7, a memorial special will honor Wylie Hammond, past Native American Center director, with men’s traditional dancing. For the full news release, visit http://www.minotstateu.edu/pio/news/2016/04/msu-honor-dance-celebrates-accomplishments-.shtml. For questions, contact Annette Mennem, Native American Center director, at 858-3365 or annette.mennem@minotstateu.edu. Minot State University will continue to celebrate the renowned work and life of William Shakespeare, poet, playwright and actor, Thursday (April 28). This commemoration of the greatest writer in the English language and the world’s pre-eminent dramatist includes a mix of films, speakers, song and theater. All events are in Aleshire Theater and are free and open to everyone. For a schedule and full news release, visit http://www.minotstateu.edu/pio/news/2016/04/minot-state-university-shakespeare-fest-celebrates-bard.shtml. 2016 marks 400 years since Shakespeare’s death. This Shakespeare Fest is a reawakening of MSU’s celebration 100 years ago. Then, the campus celebrated with a Shakespearean pageant, including the building and bedecking of a boat in royal Tudor fashion, to row down the Mouse River. For questions, contact Robert Kibler, Division of Humanities chair for literature and foreign language, at robert.kibler@minotstateu.edu or 858-3876. Minot State University students, faculty and staff will share their research and scholarly work at the 2016 Research Poster Session Friday (April 29) in the Student Center Atrium, 11 a.m. to 1 p.m. In addition to the poster presentation, a collection of abstracts will be published. For questions, contact Deanna Klein, Faculty Research Committee chair, at Deanna.Klein@minotstateu.edu. Minot State University College of Business will hold its annual Recognition Banquet Thursday (April 28) at the Grand Hotel at 5 p.m. This event acknowledges students for academic and organizational success. “The Recognition Banquet is the most important event of the year for the College of Business,” said Jacek Mrozik, College of Business dean. “It is a time for our students to be recognized for their outstanding successes and is an opportunity for our donors to see firsthand how their donations and their involvement benefit students. Donors and recipients are given the chance to meet one another and to develop relationships." Scholarships are provided by individuals and organizations to support all of the College of Business programs. Minot State University’s National Student Speech Language Hearing Association will sponsor the fifth annual Miles for Smiles walkathon Saturday (April 30) in Oak Park, beginning at 10:30 a.m. Registration is at Shelter #9 at 10 a.m. Walkers fundraise for Operation Smiles, a children's medical charity that performs safe, effective cleft lip and cleft palate surgeries and delivers postoperative and ongoing medical therapies to children in low and middle-income countries. The 33nd annual Gala Dinner and Auction will commemorate Minot State University’s history, its alumni, its students and its future May 6 at The Grand Hotel, Minot. The social and silent auction begin at 5:30 p.m., with dinner and live auction to follow at 6:45 p.m.
“The Gala is a great opportunity to support Minot State, student scholarships and the Alumni Association,” said Janna McKechnie, director of alumni relations and annual giving. Successful bidders may win an MSU granite tabletop, MSU tuition certificate, an Irish dinner for eight, and car detailing. Other items include items from vintage McFarland drapery fabric, sports memorabilia and furniture. This sold-out event comprises a gourmet dinner, music and elegant atmosphere. Attire for this event is semi-formal. For questions, contact McKechnie at janna.mckechnie@minotstateu.edu or 858-3373. 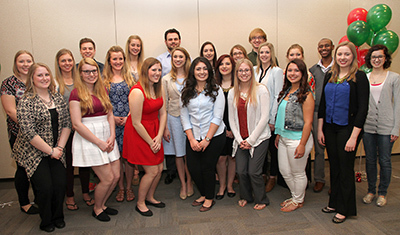 Who’s Who Among Students in American Universities and Colleges selected 23 Minot State University juniors and seniors for inclusion in the 2016 edition. A campus nomination committee and editors of the annual directory picked the students based on their academic achievement, service to the community, leadership in extracurricular activities and potential for continued success. They were honored at a luncheon April 20. The honorees were photographed. Front row, left to right, are Caley Nelson, Kelsey Buchholz, Shelby Pederson, Vanessa Ramirez, Teagan Loppe, Keyona Walker and Ashley Busch. The second row, left to right, includes Molly Haagenson, Kayla Barkie, Danielle Foster, Cassandra Stauffer, Miranda Lessmeister, Christin-Ann Stoll, Christina Beck, Reagan Van Teeling, Meggan Larson, and Annika Kraft. The third row, left to right, has Alex Buchholz, Savana Kingsbury, Bob Pond, Joshua Bussard and Ismail Hassan. Not pictured, Chloe Andracek. The students are listed by hometown, with class rank and major at http://www.minotstateu.edu/pio/news/2016/04/minot-state-university-students-honored-at-whos-who-luncheon.shtml. 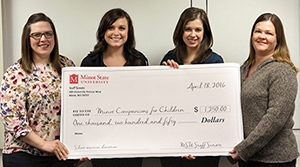 Minot State University Staff Senate presented a $1,250 check to Heather Cymbaluk from Companions for Children April 19. The funds were raised through a silent auction. Pictured, left to right, are Lindsey Benson, Heather Cymbaluk, Mindy Rudnick and Karla Bredahl. 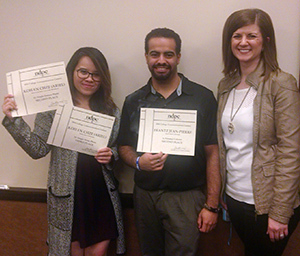 Student journalists from Minot State University took home awards April 15 from the 2016 North Dakota Professional Communicators College Communications Contest. NDPC gave 96 awards to students in 32 categories. Three MSU students nabbed awards. Koh En Chze (Ariel), Subang Jaya, Malaysia, won awards for second place for single feature photo, second place for single sports photo and third place for single news photo. Frantz Jean-Pierre, Minot, earned second place in personal column. Krys Zorbaugh, San Diego, Calif., received third place in personality profile. Communications professionals for each of the categories judged the students’ work. NDPC is devoted to the advancement of professional and student communicators through workshops, contests, mentoring and continuing education opportunities. More than 100 entries from students at five North Dakota and Minnesota universities participated in this contest. For more information, visit the NDPC website at www.aboutndpc.org. Pictured, left to right, are En Chze, Jean-Pierre, and Danielle Teigan, NDPC board member. April 27-May 5 — MSU Juried Student Art Show with guest juror Justin Sorensen of Williston, Hartnett Gallery. April 27-May 13 — “Weather Forecast: American Storm,” paintings by California artist Benny Alba, Library Gallery. Michael Linnell, assistant athletic director for communication and media relations, judged the action/sports category in the Minot Camera Club's spring competition. Tom Seymour, professor of business information technology, chaired a Higher Learning Commission campus evaluation visit to DeVry University April 19-20 in Orlando, Fla.